Welcome to the Dynamic News theme documentation. These instructions explain how to configure the theme options and setup the front page template. Since it is the same procedure for every theme, this tutorial does not explain how to install the theme. If you need help with the theme installation, please see the Install WordPress themes tutorial. Please be aware that the PRO Version of Dynamic News is an Add-on plugin for the Dynamic News theme. Therefore you have to install and activate the Dynamic News Lite theme and install the Dynamic News Pro plugin in addition. You can learn how to install Plugins on the Install WordPress plugins tutorial. In case you are using the old Dynamic News Pro theme and want to switch to the new Pro Version Plugin, please follow this tutorial. 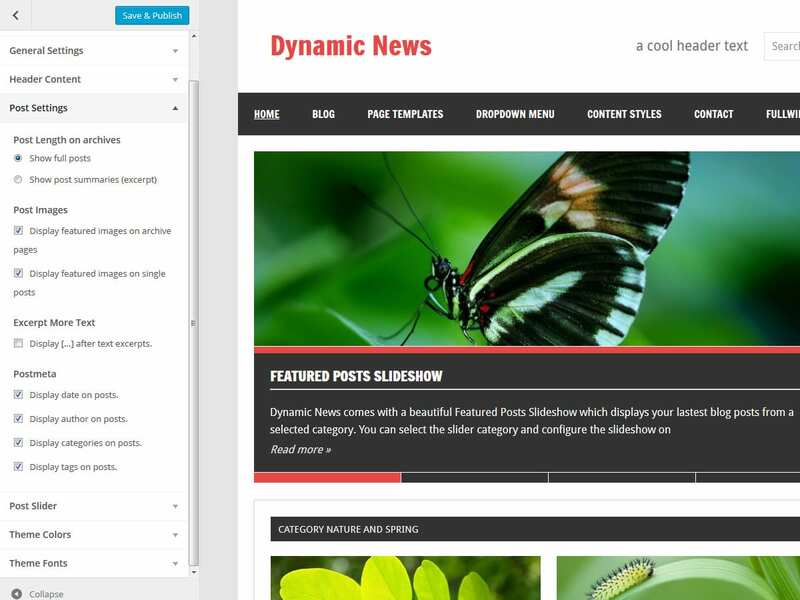 Dynamic News supports the awesome Theme Customizer. You can configure all theme settings on your WordPress admin panel → Appearance → Customize on the “Theme Options” section. Choose the theme layout and sidebar position. Upload your own logo image and turn on header content like search field and social icons. Decide between full posts and post summary and configure featured images of posts. Activate and configure the Featured Post Slideshow. This section let you choose the font and background colors of various theme elements. Change the text, navigation and title fonts easily in this section. Social icons are easy to add with Dynamic News. We simply use custom menus for social icons. Go to Pages → Add New to create a new static page, or edit an existing page. Change the page template of your selected page to the Magazine Front Page template from the Page Attributes box. If you want to use the Magazine Front Page as your homepage, go to Settings → Reading and set “Front page displays” to “A static page”. From the dropdown menu, select the homepage you created earlier. You can learn more about setting up a front page here. After you created your Magazine Front Page homepage, go to Appearance → Widgets and set up your Magazine Front Page widget area. Dynamic News comes with three different Category Posts widgets geared to creating a magazine-style site, but you can also add any other widget you like. This widget displays the latest eight blog posts from two configured categories: Category Left and Category Right. The first post of each category is displayed with the excerpt, followed by two further posts in small boxes. This widget displays the latest four blog posts from a configured category in a boxed layout, like in the screenshot below. The latest post is highlighted on the left column and displayed with the excerpt, and the right column displays three additional posts. This widget creates a two-column grid layout, showing the latest blog posts from a category you select. You can also specify the number of posts to be displayed. The Magazine Front Page template makes heavy use of featured images as thumbnails. 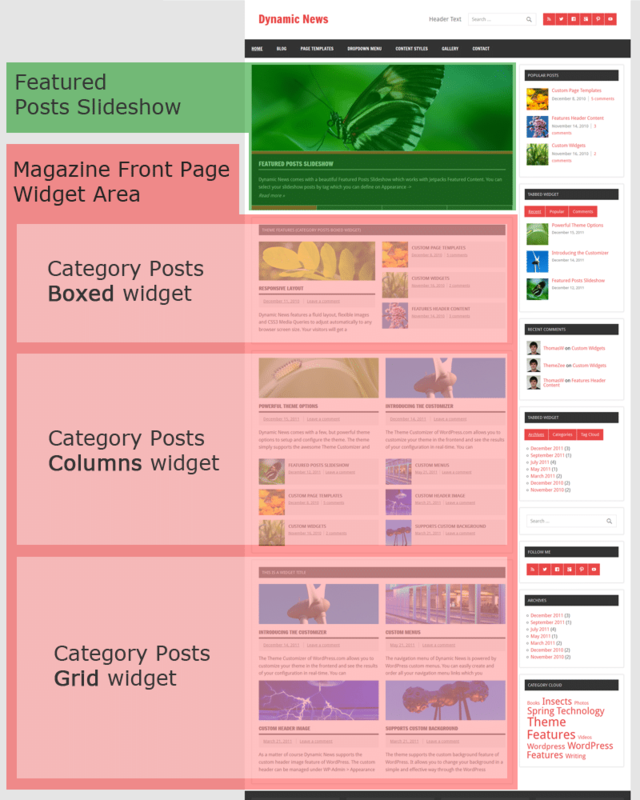 The featured posts slider and all category posts widgets will look as intended when your posts have featured images. If your existing posts have already had featured images, they may look disformed because they do not match the new required sizes for the front page template. In order to fix that you have to regenerate your thumbnails. Your uploaded featured images should have a minimum image size of 880×280 pixels in order to look good at any screen size. The slider will show a grey image placeholder in case you haven’t set a featured image. 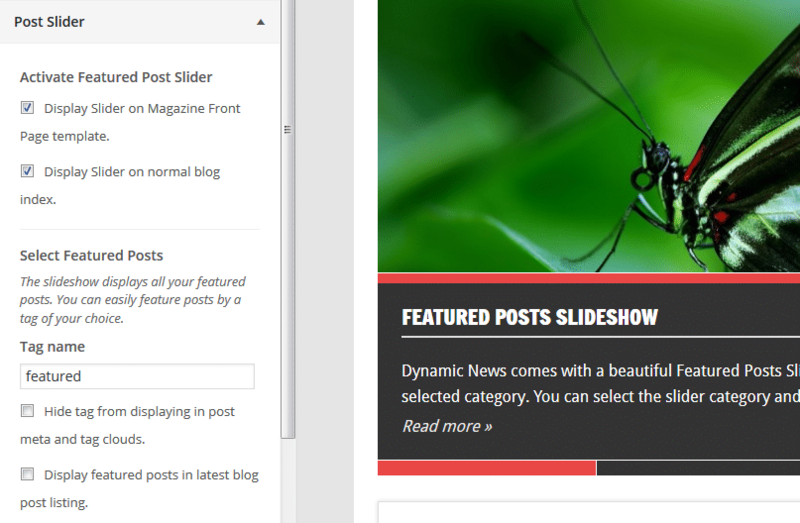 Dynamic News supports a beautiful Featured Posts Slider which displays the latest posts with a tag you’ve configured. To set up your post slider, go to Appearance → Customize → Theme Options → Post Slider, and activate the Slider first. You can enable the slideshow on the Magazine Front Page template or the normal blog page. Next, you have to configure which posts are highlighted in the post slideshow. Therefore add a tag under Tag Name in the Select Featured Posts section. The slideshow will display all posts which are tagged with that keyword. You can also set the maximum number of posts and the slider animation effect within the slider settings. The Pro Version of Dynamic News is an add-on plugin which you can purchase on the Dynamic News theme page. You can download Dynamic News Pro on our downloads page. If you need help to install the plugin please visit our Install WordPress plugins tutorial. You can customize the theme colors and fonts on Appearance → Customize → Theme Options → Theme Colors / Theme Fonts. Dynamic News Pro adds four widgetized footer areas. You can add your footer widgets on Appearance → Widgets. You can disable the credit link to themezee.com on Appearance → Customize → Theme Options → General Settings. The main content column width is 860. The Featured Images used on posts are 860x280. The Featured Images used on the Slideshow are 880x290. The thumbnails used on the Magazine Front Page template are 420x140 (big thumbnails) and 90x90 (small thumbnails). The Custom Header image will display at a maximum width of 1340 and a flexible height (default height = 200). Thank you so much for using the Dynamic News WordPress theme.